I didn’t get to play a complete game but I must say that from what I tried, this is going to be a smash hit at Essen SPIEL 2018 where it will be released. But let’s step back a bit and discuss what you are actually doing in the game. Like in Tzolk’in, the game features a unique twist on worker placement. Your workers are dice that levels up throughout the game. Once they reach level 7 they will transcend and a you will get a unique once-per-game effect (and you will get a new die at level 1 replacing the one you just ascended). You will however also push the game one step closer to conclusion. So how do you level up your workers? By doing almost everything in the game. The game board consists of a set number of worker placement areas along the edge of the board. Your workers move from board to board in a sort of rondel mechanism – you can only move one direction around the board. On your turn you move one worker die and take an effect (usually getting some goods) from the space that die ends up standing on. The amount of goods you get is depending on how many of your own dice you have at the same space as well as the level of the lowest level worker you have on the space. So you want to have your workers meeting up, but then you are limiting yourself in the available actions you can take due as you aren’t spread out on the ‘rondel’. Then there are the costs to consider. Moving on to a spot where other people have their workers is REALLY expensive. So you have to plan ahead a lot. Balancing being spread out and getting better actions from piling your workers up on the same spaces and trying to get your workers to level up at just the right time to get the right effect. You might recognize the temple tracks from Tzolk’in. It feels like they were taken directly from Tzolk’in. But even with that similarity I think the games feels vastly different. You can definitely get away with owning both of them. 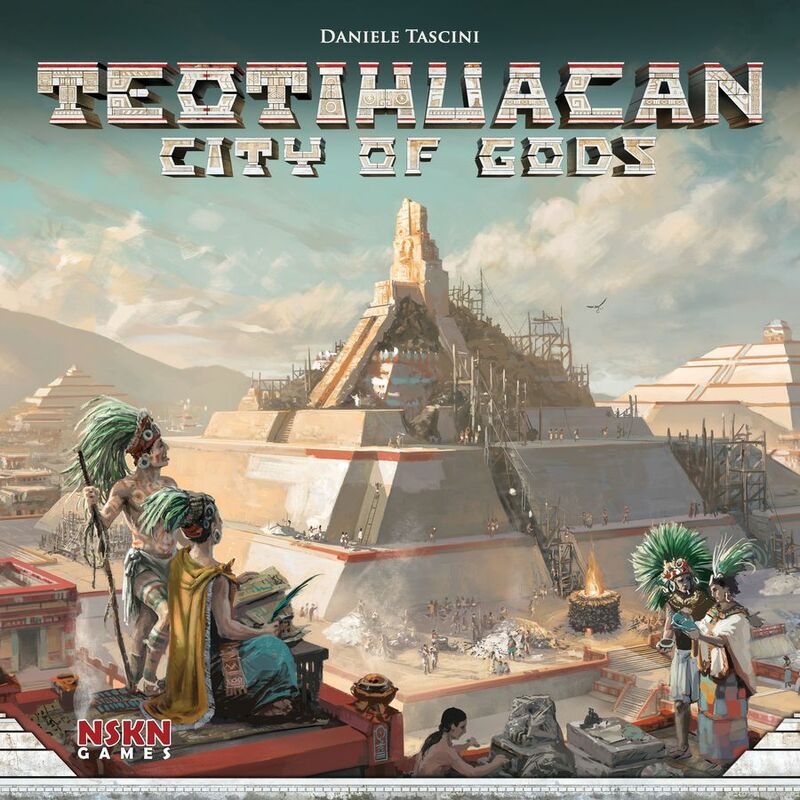 To me Teotihuacan – City of Gods felt ever so slightly less brain-burny. It felt like it was harder to put yourself in a terrible position (but still incredibly hard to play well). So from my one limited play I would give the edge to Teotihuacan. As I mentioned previously, I believe this will be a huge hit at Essen SPIEL 2018 and it is an instant day 1 buy for me.